By Sophie Allain, campaigner at Campaign for Better Transport. In the first week of 2012 thousands of rail passengers fed up with being ripped off by above inflation rail fare rises took part in a social media protest, showing that fares continue to be a highly charged political issue. It’s not surprising that British passengers are angry, Campaign for Better Transport compared a sample UK season ticket with four similar European ones and discovered we’re paying up to ten times as much as our European counterparts. Campaign for Better Transport compared the cost of an annual season ticket into five major European capitals. Despite the Government’s concession in the Autumn Spending review to cap regulated fare increases to inflation plus one per cent in January, instead of inflation plus three per cent as originally planned, the transport charity discovered the sample UK ticket cost three and a half times more than the most expensive European one, and almost ten times (9.7) more than the cheapest one. “We knew we had some of the most expensive rail fares in Europe, if not the world, but even we were shocked by how much more the UK ticket was in comparison to our European counterparts. We discovered an annual ticket from a commuter town outside Berlin, Madrid, Paris and Rome cost a fraction of the price of an equivalent ticket to London. Italian commuters pay a tenth of the UK price, while the French have the second most expensive fares and yet still only pay less than a third that passengers in the UK pay. If this was not bad enough, UK rail fares rose above inflation again this week, and Government policy means even steeper rises in 2013 and 2014. By 2015 our fares will be 24 per cent higher than 2011 prices. We hear from people, week in week out, who are affected by the fare rises; working parents who can’t afford the cost of childcare as well as their season ticket, people having to move closer to their job, families who pay more on train tickets than they do on their mortgage. It paints a very worrying picture. Complaining about the rail service is already a staple British topic of conversation, but the political weight of irate rail passengers should not be underestimated. Last year, a YouGov poll we commissioned found that 74 per cent of regular rail users in London and the South-East could switch their support away from a political party that introduced an increase in the cap on rail fares. Many people simply have no choice but to get on the train to work. Driving into London, or to any of our major cities at rush hour, only further clogs up our congested roads, making journeys even longer and adding to pollution. Regulation was brought in to protect rail passengers, but now Government policy is using regulation to bring in revenue for the Treasury. Passengers are already contributing a growing percentage of rail income and investment funding, but the lack of transparency around the issue means we can be far from sure what will happen to these additional funds. 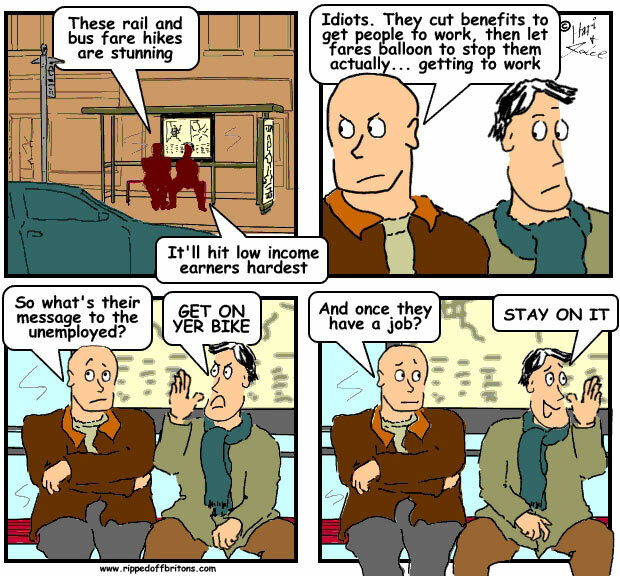 Fare rises have become in effect a stealth tax on those people who do the right thing and use public transport. 2. Examples of fares into London from other parts of the South East. Examples of fares elsewhere. 4. Campaign for Better Transport is the UK's leading authority on sustainable transport. We champion transport solutions that improve people's lives and reduce environmental damage. Our campaigns push innovative, practical policies at local and national levels. Campaign for Better Transport Charitable Trust is a registered charity (1101929). I would recomend reading the report that can be found here. The link is at the bottom of the page. It destroys the McNulty report and sets out a better vision for the future of the railways.